Will You Join the ‘Be Kind’ Brigade? Last year was a funny one wasn’t it? Looking back we can see that, actually, it was quite a hate-fuelled year. According to the Home Office, hate crimes increased by 27% in the UK, with spikes seen after the EU referendum result and various terrorist attacks. In the US, hate crimes also increased (perhaps due to a certain someone taking residence in the White House...). These events, while awful, have done something to us as a society. They’ve galvanised us, stirred a reaction and encouraged us to stand up and say “no more”. One reaction myself and many others have gravitated towards is kindness. Showing compassion to other people and ourselves is a small, but significant way we can revolt against hate. Just imagine if everyone decided to take this approach and embraced kindness - what would our society look like then? In an attempt to encourage others to be kinder to themselves and others, I started a hashtag project on Instagram for January, #amonthofkind. The idea was to share pictures and stories of kindness, whether we supported someone else, or showed ourselves a little kindness throughout the month of January, starting the year on a kind foot. As the project progressed, I noticed I wasn’t alone in my thinking. More and more people started talking about kindness. I spoke to three women who were already alongside me in the ‘be kind’ brigade. Kate Wainwright is a silversmith who recently released her ‘Good Intentions’ jewellery range. What inspired your Good Intentions collection? My good intentions collection was inspired by the New Year. Around Christmas the inevitable questions around New Year’s resolutions come up and after thinking about it a lot last year, I decided I didn't want to set another New Year’s resolution that I would inevitably fail at and then feel guilty about. Instead, I decided to set good intentions that I want to live my life by. 'Breathe', because work has been getting on top of me recently and I was forgetting to take a step back, relax and just breathe! 'Be Present' because so much of day-to-day life is spent looking forward to the next moment, and I was finding when I reached the moments I was looking forward to, instead of being 'in' those moments, I was planning the next. Finally 'Be Kind', because that is something I believe we should all be striving towards, being kinder to others and to ourselves. Being kind costs nothing but gives you, and others so much! After making myself some necklaces to serve as a gentle nudge to remember these intentions, I launched them in my online shop so that other people can use them as reminder too. They come with the already mentioned intentions, or people can choose one that resonates with them. Do you think more businesses should get involved with spreading awareness and messages like this? I really do think other businesses should spread messages like this, it doesn't always have to yell the messages like my necklaces might, but by setting good examples like sourcing ethically, treating employees well - even the ones that aren’t at the face of the company - it sets a bar for how we should all behave as humans. Business voices have such reach, they really are in a position to inspire and lead change. How do you think we can all be a little more intentional in our lives? I do think we can all be a little more intentional in our lives. In a fast paced world that expects more and more and we expect more and more for ourselves, it’s the little things that get forgotten. Like being a little more patient when you are behind that learner driver, or spending that extra time with a lonely elderly relative or neighbour. Instead of sitting in front of the TV in the evening, do some stretches to make yourself feel good or make a note of the good things that have happened in your day. If we all were able to be more mindful of our days and tweak them for the better, I believe there is the potential for that to have a huge impact on our lives. You can follow Kate on Instagram. Victoria is an artist who started her own project ‘A touch of kind’ to encourage the Instagram community to give back. Can you explain the #atouchofkind project and how it works? A touch of kind is a hashtag project on Instagram that allows people to spread some kindness to their community by giving back, in the hope that when they receive they also give a little something back and so forth. A random acts of kindness game that helps show support to small independent businesses, or simply put a smile on someone’s face by giving them a gift! I'm keen now also to remind people of how kindness to ourselves is equally as important, and sometimes simply taking 10 minutes out of our day to quiet our mind, have a cup of tea or walk a little in nature can have profound effects on our overall wellbeing. A touch of kind was started initially as a way to show some kindness back to the community I'm in on Instagram. I wanted to give a little something back to them as a thank you for being a constant inspiration and support to me. There was no # at this time, It was just me giving back in the hope that someone else may carry this on to their followers and the kindness would continue and as support also for small independent businesses. I found it had a wonderful response and it was suggested to me that a hashtag would be a good idea so people could follow their gifts along the way. A touch of kind was then born and I'm always thrilled to see someone using it as a way to show kindness to others and also to themselves. How can people join in? The rules are very basic and as flexible as you want them to be. All it requires is a little time, a little gift and postage costs to the winner/s. If you're a maker then using one of your products if it works in with your costings, but if making isn't your thing that’s not a problem, as even a nice bar of chocolate or a handwritten letter would be wonderful! I think it’s a lovely way to share some of our favourite makers if we can. It's then a case of telling people on Instagram what you’re up to! You can do as many gifts/winners per game as you wish, and it’s important to explain when the game is finishing so folk know when to enter by and also explain that if they win, then they have to Pay it Forward to their followers also. Using the #atouchofkind means the journey of each gift can be followed. Of course if you're choosing kindness for yourself then share your photos on Instagram using the hashtag, tell people what you’re up to if you wish. Hashtags are a great way of meeting like-minded folk. What do you think holds people back from being kind to themselves? I think people, women particularly, are used to putting other people before themselves. I know from my own experience I'm always bottom of the list after my family and I'm starting to realise this can cause burnout. The fear of letting people down, whether that be family members or our work colleagues. It’s easier to look after them sometimes, than it is to face up to how much we don't take the time out we perhaps need in our daily lives. 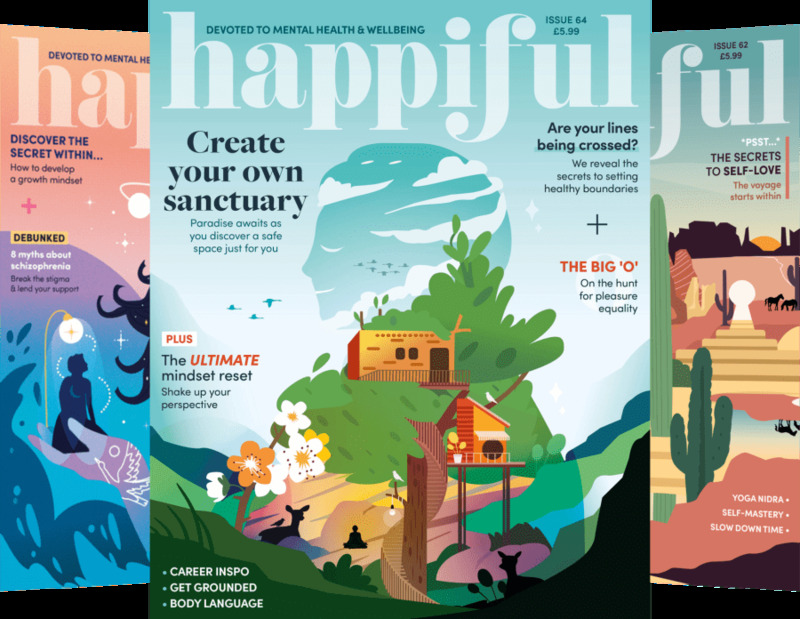 Finally, I speak to Ellen Hoggard, a fellow Happiful contributing writer about her journey to be kinder. What changes have you made in an effort to be kinder? I’m trying to make sure I talk to my friends more. We’ve all got very wrapped up in our own lives, which of course is expected, but every week or so, I’m making an effort to either plan our next meeting or at least see how they’re doing. On that, I’m also trying to speak to new people. Whether it’s a hello and a smile to a passerby on the way to work, or a small conversation with a shop assistant. I love talking to people and it can really brighten my day, meeting someone new, not to mention how much it can impact the other person’s day too! I’m also trying to be kinder to myself, by really listening to my body. I can be quite hard on myself if I don’t go to the gym or have eaten more chocolate than anything else on one day when really, what’s the harm? I want to listen to what it is my body and mind needs - one day that’s fresh fruit, vegetables and a sweaty workout, other days it’s chocolate, wine, rest and time with friends or on my own. I’m practising knowing that whatever it is I want that day, there’s nothing to feel guilty about. How do you think kindness affects mental health? Oh I think it can affect mental health massively. Being kind both to others and yourself is something we all need to practise - it costs nothing, yet can change a life - why would you want to bring unhappiness to yourself or another person? We’re all in this together and should bring each other up, not down. What's one thing you think we can all do to be kinder to ourselves? We really do need to ease up on the pressure. Imagine you saw a manager or higher authority constantly pressure a colleague - you’d watch them crumble away until they’re nothing. We know it’s not acceptable to behave in this way, so why do we do it to ourselves? We can be very cruel to ourselves, whether it’s our diet, our appearance or our lifestyle, we compare to others and to the ‘ideal’ way of living. But really, none of it matters. Who cares if you had two chocolate bars today - it’s not the end of the world. It may not nourish your body, but it can nourish your mind and soul in other ways. Likewise, an old school friend may appear to have a dream life - success, money, family - but they’re not you. You are wonderful and you have your own life, you needn’t compare because no one is you. Be kind to yourself and remember that life is full of ups and downs. We’re constantly learning and really, life is way too short to spend time comparing yourself to others. These are just a few stories in a sea of incredible kindness happening out there, and the fact is - we all have the power to make a difference. Whether you’re marching in a protest, starting a hashtag project on Instagram or pledging to smile more at strangers, you’re doing something incredible and revolting against hate. This Saturday is Random Acts of Kindness Day, so what better time to start? I’m excited to see just how big the ‘be kind brigade’ will become and what ripple effect it will have on society because, let’s face it - kindness has the power to change the world.